SINGAPORE AND CHINA, July 19, 2018 – Esco Aster, a contract development and manufacturing organization (CDMO) of Esco Group, today announced the launch of lentiviral vector platform and bioproduction technologies to support the Chimeric Antigen Receptor Therapy (CAR-T) pipeline in China. Through an international collaboration, Esco Aster has launched the lentivirus platform and bioproduction technologies in Wuhan Bio-Raid Biotechnology’s large state-of-art manufacturing cGMP facility, and the MoU signing was witnessed by Mr. Sam Tan, Singapore Minister of State for Foreign Affairs & Ministry of Social and Family Development, during his courtesy call on the Wuhan municipal leaders (see Annex). “We are very pleased and excited to enter into this strategic partnership with Wuhan Bio-raid Biotechnology, one of the prominent players in CAR-T therapies in China. 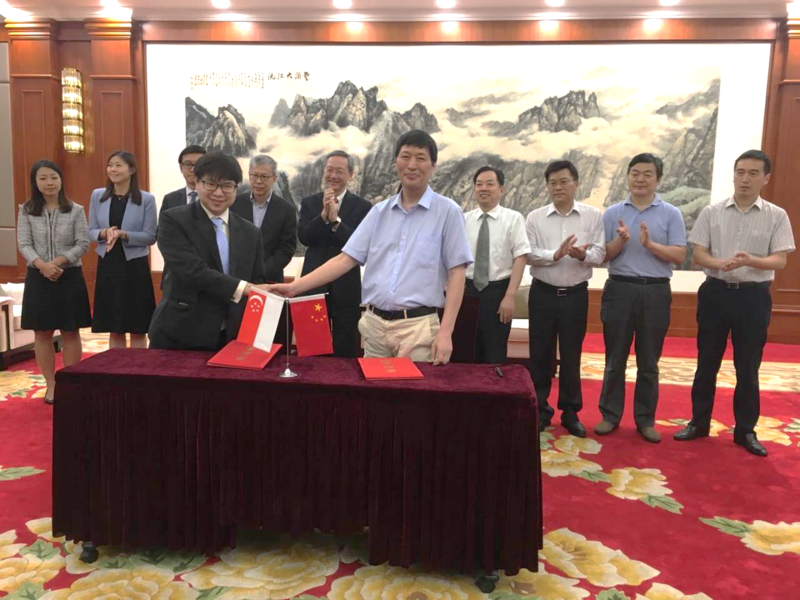 This partnership，results from the purchase of Esco’s Biological Safety Cabinet，is a strong motivation for entering a win-win collaboration with this highly dynamic company, ” said Mr. Xiangliang Lin, Esco Aster, Chief Executive Officer. To meet Chinese market’s demand for lentiviral vector (LVV) needed for CAR-T clinical trials, Esco Aster aims to support CAR-T pipelines from discovery to delivery through cGMP production. Their expansion to the emerging CAR-T field is built upon a history of success in the commercialisation of Tide Motion bioreactors. Esco Aster has successfully applied a process-intensive novel seed-train cell culture strategy using adherent HEK 293T cells. Vials from a high-density cell bank are used for direct seeding into a single-use CelCradle™ bioreactor to generate adequate cell numbers needed for LVV production in TideCell®. This process-intensive seed train strategy as opposed to conventional seed trains, provides a smaller working footprint, time-, cost- and manpower-effectiveness. Such an implementation and improvement can vastly increase the productivity of current LVV cell culture manufacturing facilities. “Traditionally viral vectors are generated using cumbersome multi-stacked 2D vessels. Comparing them with our patented bioreactors, we have successfully shown the manufacturability of viral vectors towards a commercial scalable process adding overall advantages in terms of simple protocols, ease and relatively low cost to generate Lentiviral vectors,” said Dr. Calista Ng, Esco Aster, Bioprocessing Scientist. “Given that Wuhan Bio-Raid is one of the leading CAR-T companies across China, we are excited to further our viral vectors development capability in cGMP manufacturing suites executed with the expansive scientific resources and expertise to rapidly establish a reliable commercial supply for the most difficult to manufacture CAR-T therapies,” said Mr. Zhang Tong Chun, Wuhan Bio-Raid Technology, Chief Executive Officer. Above is reproduced at BioSpectrum. Founded in September 2014, Wuhan Bio-Raid is led by Professor Zhang Tong Cun, Dean of Biomedical Research Institute of Wuhan University of Science and Technology and a clinical immunology expert and clinical researcher of Duke University, Stanford University, University of North Carolina, Wuhan University of Science and Technology. The company is committed to the clinical research and industrialization of chimeric antigen receptor T cell (CAR-T) technology. Cell therapy and regenerative advanced medicine products have gained significant importance, particularly in the field of Chimeric antigen receptor T (CAR-T) therapy. August 2017: Novartis’ CTL019 Kymriah, licensed from University of Pennsylvania, gaining FDA approval for patients with acute lymphoblastic leukemia (ALL) for pediatric and young adults. December 2017: After Gilead’s acquisition of Kite Pharma (US$12 Billion in cash) in 2017, Kite Pharma’s Yescarta was approved for adult patients with relapsed/ refractory large B cell lymphoma. January 2018: Celgene bought Juno Therapeutics for US$ 9 Billion to expand into CAR T therapy. March 2018: Temasek and Sequoia China has recently announced the lead round of Series A financing of US $90 Million in JW Therapeutics China, alongside with WuXi AppTec Group, that focus on JWCAR029, a CAR-T therapy for treatment of B-cell malignancies, to develop a therapeutic pipeline and build a new commercial manufacturing facility. March 2018: Chinese FDA approved the clinical trial application of LCAR-B38M CAR-T cell reinfusion preparation from Nanjing Legend Biotech. May 2018: Novartis announced the FDA has approved Kymriah for its second indication to treat adult patients with relapsed or refractory (r/r) large B-cell lymphoma.